The traditional gamepiece celebrated the spoils of the hunt and also the bounty of food in the homes of the wealthy, from (especially) the 16th to 19th centuries. In works by Dutch artists such as Willem van Aelst, pyramids of fruit and dead birds (often including mallards), depicted in jewel-like cascades of colour against a dark ground, invoked a golden age of abundance with a mythological resonance; behind the unblemished grapes and pale feathers the presence of Artemis, goddess of the hunt, Demeter, goddess of the harvest, and Dionysos, god of wine and the chase, hovered for the classically-educated patrons of these artists. 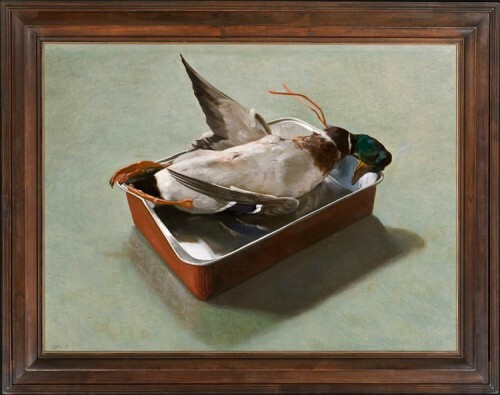 Stephen Rose subverts the long tradition of the gamepiece in this startlingly modernist work, in which the bent foil roasting tray has become a type of archaic sarcophagus, and the unsettlingly human pose of the dead mallard calls up other gods and myths – Icarus, fallen from the sky, Adonis killed during the hunt, Cycnus transformed into a swan.